While the idea of taking small doses of illegal psychedelics in order to be more productive at work might sound like an absolute nightmare to many, microdosing has swiftly become many professionals’ ‘secret weapon’ for boosting performance in the workplace. 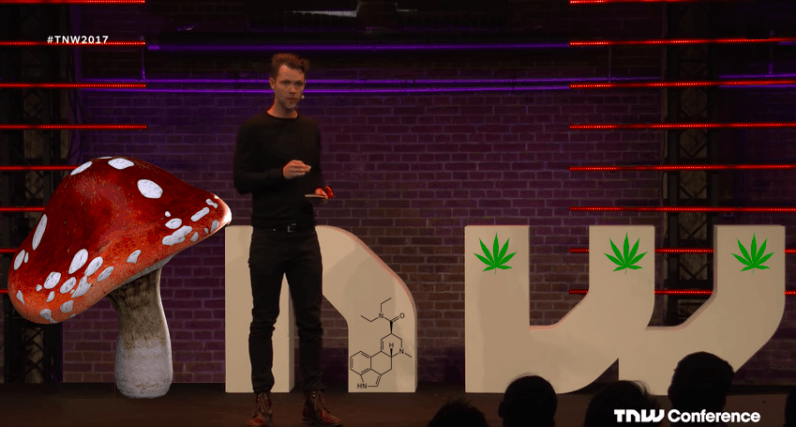 Earlier this year, at TNW Conference 2017, we were lucky enough to have Paul Austin share his insights about the contentious world of microdosing. Founder of The Third Wave, a company devoted to changing the cultural perception of psychedelics, Austin isn’t shy when it comes to talking about his experiences with drugs. “There aren’t a lot of anecdotal reports to call on from leaders in Silicon Valley. I assure you, many of them do do psychedelics, but culturally, the cost-benefit of publically saying that is not quite where it needs to be yet. So I’m going to draw on myself,” he explained. After suffering feelings of vulnerability, finding it difficult to connect with people, procrastinating, and experiencing creative blocks, Austin turned to microdosing in 2015. “Microdosing isn’t about taking a small amount of psychedelics once. It’s about a protocol, a regimen. It’s about committing to the process of letting your experience develop,” he explained. Upon finding success in the stringent process, Austin started The Third Wave as a side project. The name comes from the idea that there have been three ‘eras’ of psychedelic use. The ‘first wave’ was indigenous use for thousands of years. The ‘second wave’ was the reintroduction of psychedelics to Western society during the 1960-70’s counterculture. And ‘The Third Wave’ is where we’re at today: beginning to reintroduce psychedelics into everyday society in a practical and measured way. The company wants to help society recognize that microdosing has the potential to increase creativity, energy levels, focus, and relational skills. All these improvements in a work context can lead to major advantages. What can microdosing do in terms of leadership? Leaders must be able to adapt to changing work environments, enable team members to create purpose, and ultimately, project meaning in the work they do. Finding creative solutions to big problems is a necessary skill for all leaders of today. And according to Austin, microdosing “will become an increasingly useful tool in a leaders toolbox” to assist with all of the above. Drawing on his experience managing an online teaching business, Austin found that while working during his microdosing routine, he was more patient and less egoistic when receiving feedback, allowing him to have a clearer vision of the future. He’s also seen benefits whilst working for The Third Wave. By being able to be more present and engaged with talented team members, he’s better able to integrate people’s insights into the business and build a better future for the team. With all the reported benefits of microdosing, we decided to ask our startup community here at TQ, a curated tech hub in Amsterdam, whether anyone has tried it, and how it affects them in a work context. While three members did private message me to let me know they’ve had vast experience with psychedelics, no one fessed up to actually microdosing to improve their managerial chops. Neither them nor us were very sure how this affects their performance at work, but I guess it’s cool to hear that some of our community are at least open to the idea. “Don’t go to work,” and “Start low, slightly increase and calibrate as you need” are Austin’s main pieces of advice for those trying microdosing for the first time. Having a clear purpose or intention before microdosing is also fundamental. And given the illegal nature of psychedelics, care must be taken in making sure what you get is what you asked for. While microdosing is, understandably, not for everyone, it’s exciting that the potential benefits of psychedelics are finally being taken seriously in a scientific and rational context. I can’t say that I’m ready to try it just yet, however, Austin has definitely got me intrigued. We’d love to hear what you think about it – especially if you have personal experience.